Your little gymnast can show off her moves with Gymnastics Party software collection * Planning for the special day is so easy with this collection. * Eveything you'll need, from sending invitations to scrapbooking after the party * Ready-to-print images for decorations and activities to throw a fun party for children and adults * NO software to install! 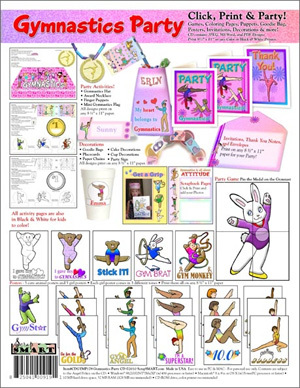 This collection has high-resolution Jpeg, PDF, and MS Word files Now your little gymnast can show off her split, cartwheel, and somersault with the Gymnastics Party software collection! Planning for the special day is so easy with this collection. And dont wait for a birthday to enjoy this collection! It's a great idea for play dates, sleepovers, day care activities, coaches, schools, and more! Planning this party is fun and easy. 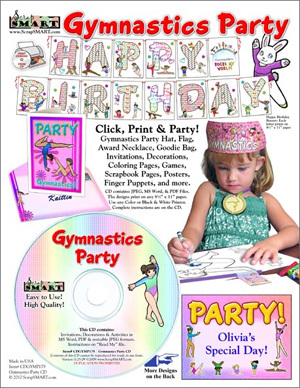 From sending invitations to scrapbooking after the party, the Gymnastics Party provides ready-to-print images for decorations and activities to throw a fun party for children and adults! These instructions will guide you through what to do with each of the files on this CD to make that special day a perfect 10.0! 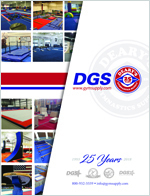 Gymnastics Party software collection contains: * Invitations, thank you notes, envelopes * Party guest list. * Decorations: o Happy Birthday banner o Place cards o Party sign o Posters o Paper chains o Cup decorations o Cake decorations * Activities: o Gymnastics hat o Gymnastics flag o Gymnastics medal o Finger puppets o Pin the Medal on the Gymnast game & game pieces o Paper chains o Goodie bags o Coloring pages * Scrapbook & photo pages * Complete instructions for planning and hosting a successful party * Checklist of supplies needed. There is NO software to install! The CD contains high-resolution PDF, Microsoft Word, and Jpeg files. Print on any 8 1/2" x 11" paper. Jpegs are resizable to customize projects. --- --- Resize designs with the FREE Picasa program from ScrapSMART's website. This is a wonderful addition to your creative library. ScrapSMART has 175+ collections on CD or to download with vintage designs or original illustrations. For ages 7+. Easy to Use in PC & MAC - For personal use only. Contact us for commercial use.